Art And Social Issues Translate Into Murals in Delhi's Lodhi Art Festival. 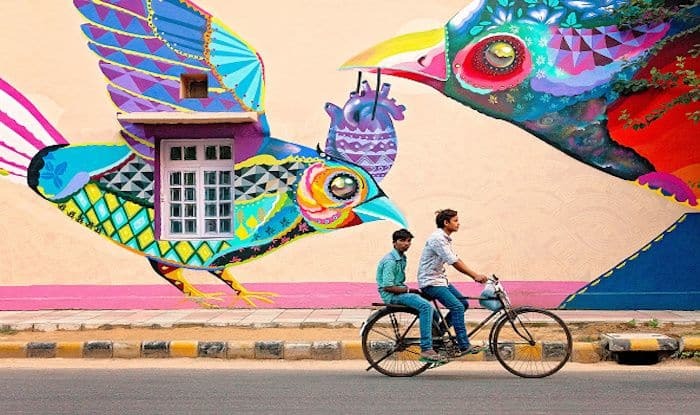 Lodhi Colony in Delhi is one of the most loved spot in the city; essentially because it has some really gorgeous murals that have been the work of national and international artists from all over the world. Th initiative is the brainchild of St+Art India Foundation – they’ve been instrumental in beautifying Delhi along with many other cities in the country. The Lodhi Art Festival is in full swing again (started on January 15, will go on till March 15); which means there’ll be glorious additions to the murals in the area and you can participate in the exquisite photo walks and walking tours that are going to happen. This two-month long event is in its third edition – and there’s a lot of potential that the brightly painted walls and their perky subjects will hold. This year it features 30 new artists, musicians, chefs and performers from around the world. Twenty new murals have been promised to Lodhi, with the aim to highlight an array of social causes such as women’s empowerment, climate change, waste management, up-cycling and other pertinent issues. Look out for the Polish artist NeSpoon’s work – he will collaborate with the community women from Lodhi District, using their lace-work patterns as inspiration to create large paintings. Also, LGBTQ themes will be woven into the artwork by Aravani Art Project. Other international artists include Brandon Tay (Singapore), Georgia Hill (Australia), Yoh Nagao (Japan) and Daan Botlek (Netherlands) while from India, Sameer Kulavoor, Hanif Kureshi, Sajid Wajid and Shilo Shiv Suleman will participate. The aim this year is also to make artwork more interactive, using emerging technologies. Technology has largely changed the way we interact with the outside world. It has made art more accessible. However, has Instagram weakened our link to the real art world? F(r)iction delves into this topic with the help of an immersive walk-through at Kona in Jor Bagh Market, displaying artworks and perspectives of national and international artists. You can also be a part of the artwork: grab some spray cans and colours and get on with the creativity as part of the specially curated workshops for adults, children and the differently-abled. In addition, there will also be public movie screenings of old Bollywood movies for everyone.